Our next I Am Strong Challenge is about Gratitude! We often don’t take time to sit and think about what we are thankful for. We are challenging our members to write five to ten things we are thankful for! By writing five to ten things you are grateful for a day can help improve your well-being by 10%! (Selgiman et al, 2005). By writing these thoughts down. Also you are more likely to have a much happier and healthier lifestyle. Similarly, it has been indicated that by triggering the gratitude emotion. As a result you are more likely to have positive feedback loops. Therefore giving yourself more positive feelings (Stone & Stone, 1983). Due to having a grateful attitude, you are more likely to look after yourself. Therefore more likely to exercise (Morin, 2015). Even more so it helps to reduce frustration. As a result helps improve happiness and reduce depression (Morin, 2015). Furthermore, if you more grateful you are likely to become more sensitive to a situation. Therefore reduces the impact of the desire to seek revenge (Morin, 2015). As a result we are challenging you to take this positive step for a more grateful self. 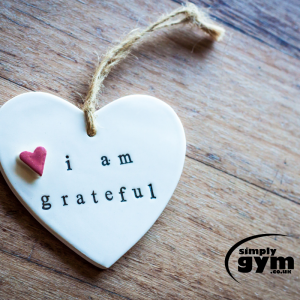 Make sure to check out a local Simply Gym to you at: http://www.simplygym.co.uk in helping you to a more grateful and positive 2019. Morin, A. (2015). 7 Scientifcally Proven Benefits of Gratitude. Psychology Today. https://www.psychologytoday.com/gb/blog/what-mentally-strong-people-dont-do/201504/7-scientifically-proven-benefits-gratitude. Seligman, M.E., Steen, T.A., Park, N. and Peterson, C., 2005. Positive psychology progress: empirical validation of interventions. American psychologist, 60(5), p.410. Stone, D.I. and Stone, E.F., 1983, August. The Effects of Feedback Favorability and Feedback Consistency. In Academy of Management Proceedings (Vol. 1983, No. 1, pp. 178-182). Briarcliff Manor, NY 10510: Academy of Management.